Joint Secretary for the Ministry of Petroleum and Natural Gas, Government of India, Ashutosh Jindal (IAS) reflects on the changing landscapes of digital governance in India and its impact on his day-to-day decisions as a bureaucrat. He talks about the role of data and technology in driving the Pradhan Mantri Ujjwala Yojana (PMUY), including efficiently tracking the scheme across India, identifying locations for new LPG distributorships, and monitoring scheme beneficiaries. Q1. Why was it challenging to roll out Pradhan Mantri Ujjwala Yojana (PMUY) throughout the country? Ans. When we launched the Pradhan Mantri Ujjwala Yojana (PMUY), it was a very new scheme for us in terms of the scale of implementation and the challenges involved. When we started the scheme, we were not sure if we’ll be able to roll it out uniformly across the country, whether we’ll be able to achieve the numbers we are talking about. Just imagine — we have 700 districts and more than 6 lakh (600,000) villages in the country. It’s not easy to have village-level information. The model earlier was that if we want to implement a scheme, we will devise the scheme guidelines and send it across to the field officials. Then we’d hold regular review meetings to keep track of what’s happening in various parts of the country. Q2. 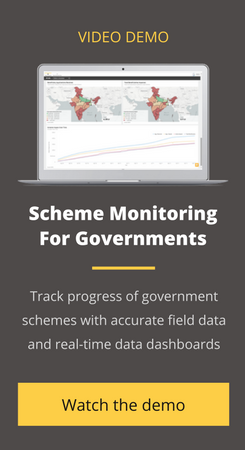 How did you use data intelligence to track the scheme across India? Ans. From the first day, we were convinced that we have to use technology and data analytics for ensuring the scheme is not only implemented properly. We monitor the scheme, we collate the data, and here the role of SocialCops came in. We started with the monitoring dashboard for the minister and other senior officials of the ministry. This dashboard was a very useful tool for the important stakeholders to know on a daily basis what’s happening in various parts of the country. If I find from the data that a particular village is not taking refills in the last two weeks, I can immediately send a team and reach out to them to find out why. Q3. How did data intelligence help you identify the best locations for new LPG distribution centres? Ans. We realized a very important task before us was how to roll out new distributorships. When you give LPG connections to a new consumer, he also has to be given the services of LPG refills, for which you need to set up more points of sale, or LPG dealerships as we call them. Again, we worked very closely with SocialCops to develop a very innovative platform where we used GIS and geospatial mapping to plot all the existing distributorships on the map. We plotted the habitations and we tried to overlay these 2-3 important data fields, and reach a new distributorship location. Using this model, we have identified more than 6,000 locations across the country — of which we’ve already advertised 1,600 in some of the biggest states. Using geospatial mapping, the goal is to ensure that every village is within 10 kilometers of a distributorship. Any consumer should be able to access a distributor within 10 kilometers of his or her residence. Q4. How did data intelligence help monitor scheme beneficiaries and safety guidelines? Ans. We also wanted to ensure transparency. The current task at hand, wherein we are working very closely with SocialCops, is to capture the photographs of the beneficiaries and put them up on a portal like our website. We have uploaded close to 100,000 photographs on the portal. It’s a great step forward in terms of transparency, in terms of the availability of the consumer details. I can immediately go to the portal, check whether that particular beneficiary has the connection or not, based on the information available. Q5. How did data intelligence affect your daily decisions? Ans. Technology has completely changed the landscape. I don’t need to hold review meetings. I know on a real-time basis which people are doing well, and I can connect to them on a one-to-one basis immediately using technology. Earlier we used to work without these tools, and now virtually I can run my office with my mobile phone and my iPad. It’s a very strong form of governance, based on the use of technology wherein I get immediate feedback from the field. With this exercise, we have been able to excise a large amount of those grievances on the field level. Technology is a great enabler — it makes the life of people like us much easier. Read more about our work with the Ministry of Petroleum and Natural Gas in powering the Pradhan Mantri Ujjwala Yojana at here. Check out this interview with the Hon’ble Minister of State for Petroleum and Natural Gas, Mr. Dharmendra Pradhan wherein he talks about the challenges faced in implementing Pradhan Mantri Ujjwala Yojana throughout the country here. Want to know how the Ministry of Petroleum and Natural Gas uses data intelligence to plan, track and monitor India’s largest LPG subsidy scheme? Learn more about our platform here!